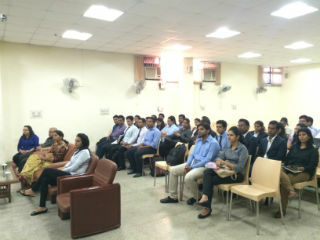 Interactive Session on Change Management, how change is inevitable in today’s environment"
Jagan Institute of Management Studies organized a guest lecture was organized on the topic on "Change Management, how change is inevitable in today’s environment" for PGDM Batch 2013-2015. 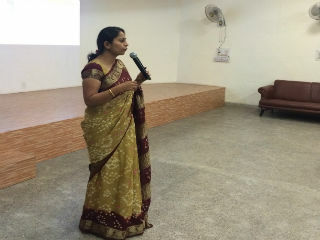 The key-note speaker of the session was Ms Urvashi Sareen, Senior Manager – HR, Tech Mahindra on 18th October 2014. As it is the most important thing in today's scenario, she discussed about all the relevant aspects of Change Management -- She picked up the case of Tech Mahindra Satyam acquisition & how it had to revive its entire strategy to survive and sustain in the drastically changed environment. Not only they survived, but due to effective implementation of various strategic tools & other measures they have been able to bring their share price up to three times of what it was at that time. She categorically talked about steps in Change management; Due Diligence, Solution's & Implementation for better results. Proactive Communication, Team Building & Career Planning being the major roles of a Human Resource of Tech Mahindra or any other organization that could get a sense of security to it is employees at the time of acquisition. 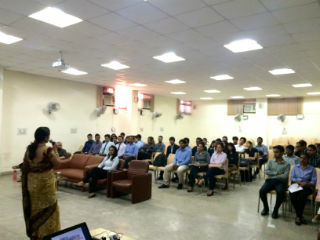 Furthermore, she discussed about the hierarchy structure at Tech Mahindra, a brief about the opportunities available, etc. 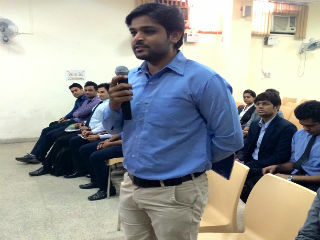 Students asked several questions on the concerns they had which were duly answered & they also learned how important it is to actually strike a thinking that adds value to the business, having a contingency plan, assessing risks, holistic sales pitch, smart goal sheet, articulating oneself not last but not the least Emotional Quotient. Overall the session was very informative & beneficial for our students.